We love recipes with simple ingredients that come together easily and taste great! 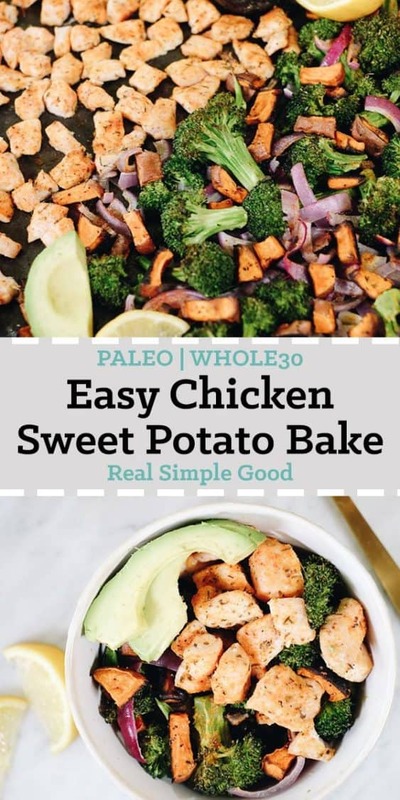 This Paleo and Whole30 chicken sweet potato bake is a great way to get lots of vegetables in with some basic seasonings to create a flavorful and filling meal. 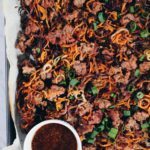 You will love the hint of citrus in this Paleo and Whole30 compliant sheet pan meal. 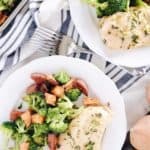 It will make a great weeknight dinner or would also be a wonderful make ahead meal prep recipe. 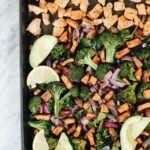 We are always on board for one pan and sheet pan meals because they make clean up that much easier. 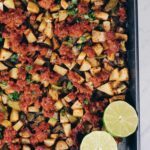 Depending on the size of your sheet pans, you might be able to use just two pans if yours are pretty large, otherwise, you might have to use three smaller sheet pans. Either way, a quick tip to aid cleanup is to line your sheet pans with parchment paper. Then, you can simply toss the parchment away when you go to clean up dinner and give your pans a quick rinse as needed. 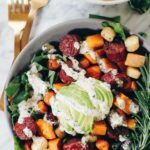 It’s always great when you can throw together a meal that has a solid variety of flavors and colors. 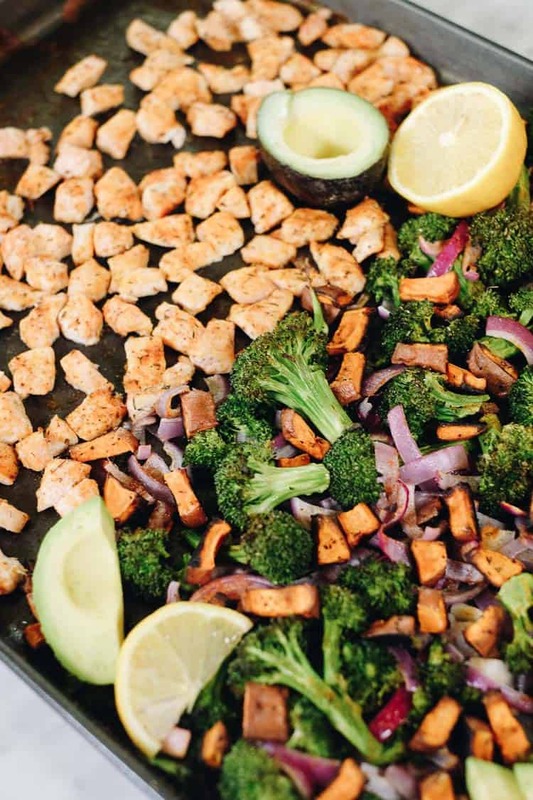 We used sweet potatoes, which you could sub with the squash of your choice, broccoli and red onion. Plus, some simple seasonings combine to give these ingredients some serious flavor! 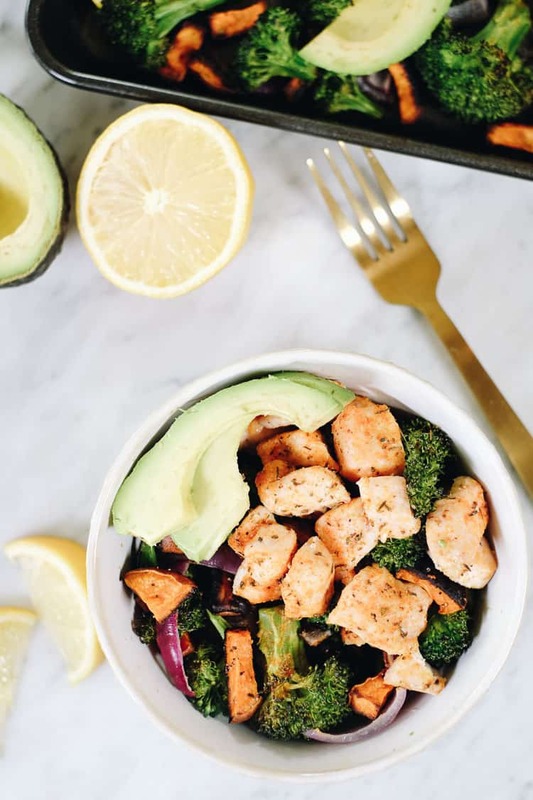 Add a little squeeze of lemon juice over everything and creamy avocado after it has cooked and your tastebuds will be so happy! It is always our goal to make our recipes easy to follow and with simple ingredients. 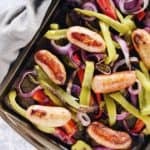 It really doesn’t have to be complicated or hard to cook up a tasty meal for you and your family. We think the whole family will enjoy this easy to make chicken sweet potato bake! Got a busy week? Don’t sweat it! 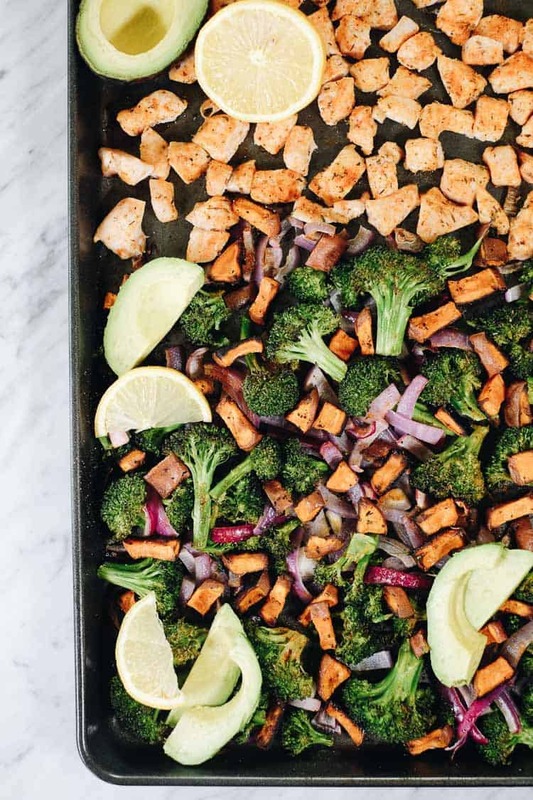 Try this chicken sweet potato bake and enjoy the simple, fresh and flavorful ingredients. Let us know how it goes by leaving a comment below. Also, take a photo and tag us on Instagram @realsimplegood, so we can check it out! Preheat oven to 400° Fahrenheit and line 3 sheet pans with parchment paper. You'll use one for the chicken, one for the sweet potatoes and one for the veggies (veggies and chicken can be combined on one large pan). Prepare chicken seasoning mix by combining all seasoning ingredients in a small bowl or jar and mixing well. Cut chicken and place it on one of the sheet pans. Sprinkle seasoning over chicken and toss to coat. If you have any leftover seasoning, you can use it to season the veggies. Set chicken aside while you prep the remaining ingredients. Chop sweet potatoes as noted and place them on a sheet pan. Drizzle with 1 tbsp avocado oil and season with salt and pepper. Toss to coat and place potatoes in the oven to roast for 30 minutes. Chop broccoli and onion as noted and place them on the last sheet pan. Drizzle with 1 tbsp avocado oil and season with salt and pepper. Toss to coat. 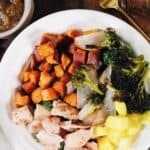 When the sweet potatoes have 20 minutes left, place the chicken and veggies in the oven to roast. Remove everything from the oven. Squeeze lemon juice over the veggies. 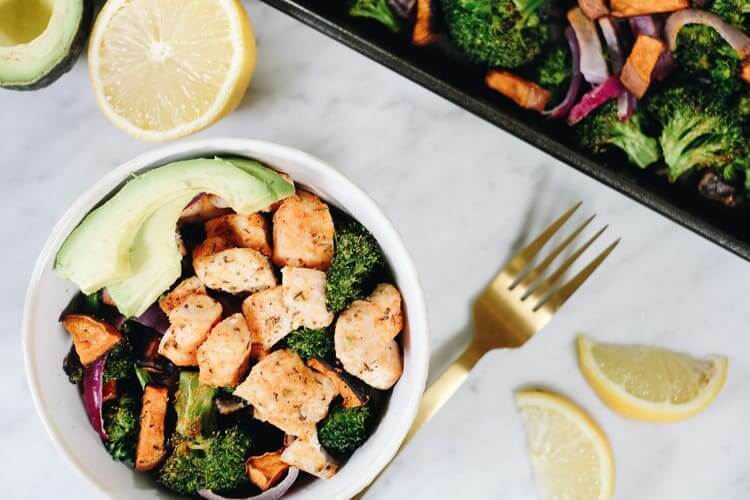 Serve everything together topped with avocado slices.